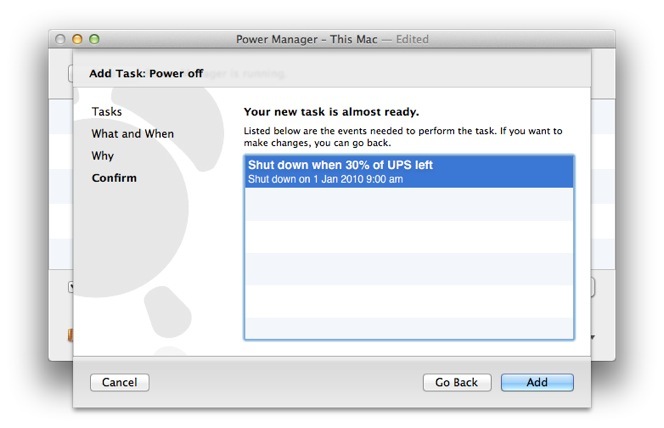 Power Manager can shut down your Mac when the remaining power of an Uninterruptible Power Supply (UPS) drops to a critical level. This recipe walks through how to set this up. 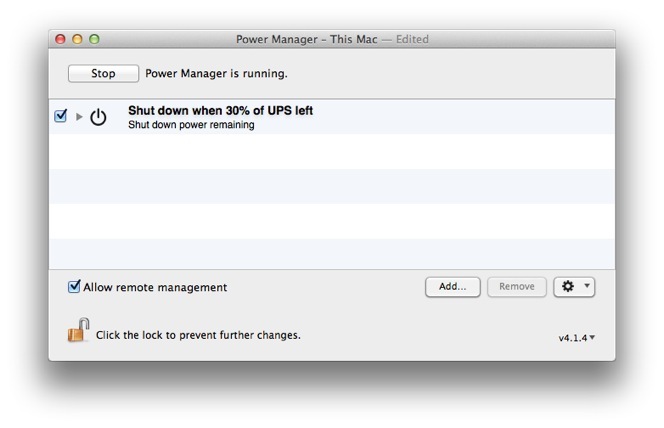 An uninterruptible power supply provides an extra level of protection for a Mac. Used in environments where power cuts are frequent or where sudden loss of power risks critical systems, UPS devices are essential. A UPS typically provides a few minutes of power to keep systems up and running. 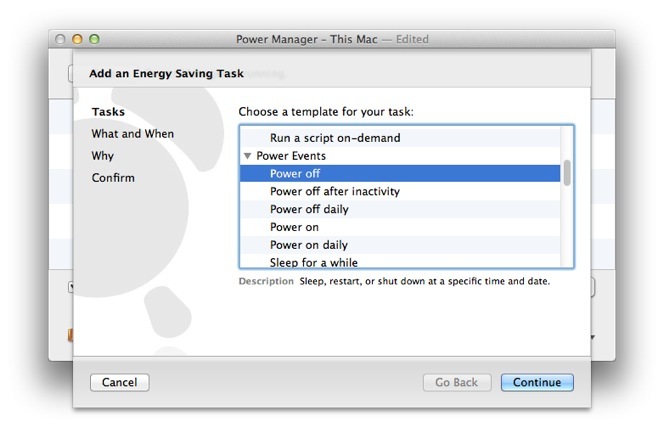 During this time your Mac can gracefully stop critical systems and be shut down cleanly. 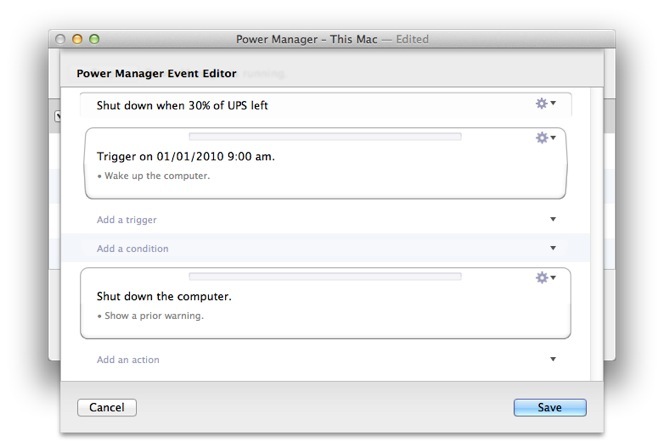 Power Manager provides triggers and conditions to craft events to ease those frantic moments when the power fails. 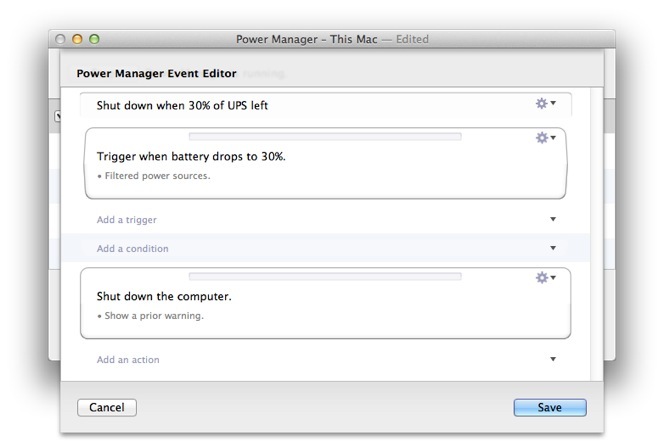 You can create multiple events triggered at different stages of the power failure. You might create an event that warns of the power cut and that the UPS is being relied upon. Another event might start closing critical systems once battery's remaining power has reached 50%. A final event might shut down as the power drops to 30% remaining. 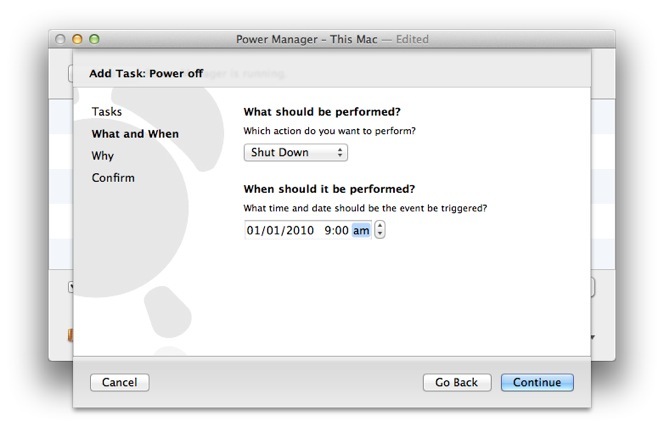 This recipe will create an event that uses the power remaining trigger and a power state condition to check the UPS is being relied upon, before shutting down the Mac. The event we want to create is not represented by a Schedule Assistant task. We are going to have to create the event in parts. 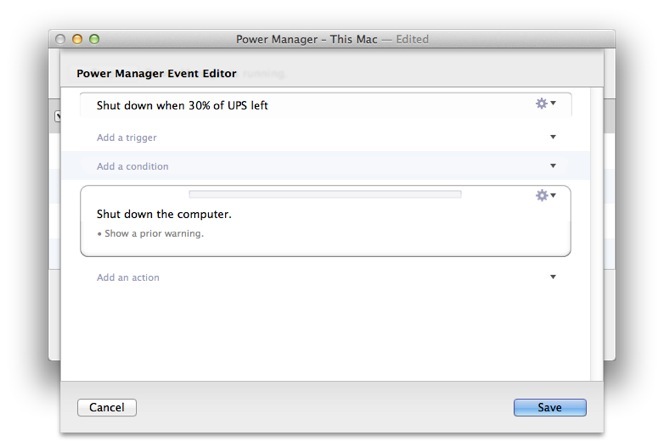 The first part creates an event to shut down your Mac. We will modify this event in the second part. The basic shut down event is ready but will never be triggered - the date is in the past. In this second part we will replace the event's trigger. To do this we need to use the event editor. 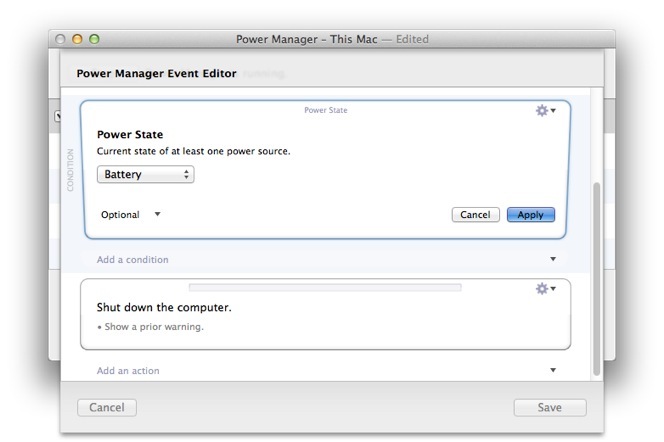 In this final part we will add a condition to ensure battery power is being relied upon before starting the shut down. Apply to save changes to the condition. Your event is almost ready. Save to save the event to your schedule. The event is now finished and immediately added to your schedule. The event is triggered each time any USB connected power supply's power capacity passes 30%. The capacity need only pass 30%; the trigger does not differentiate between a rising or falling capacity. 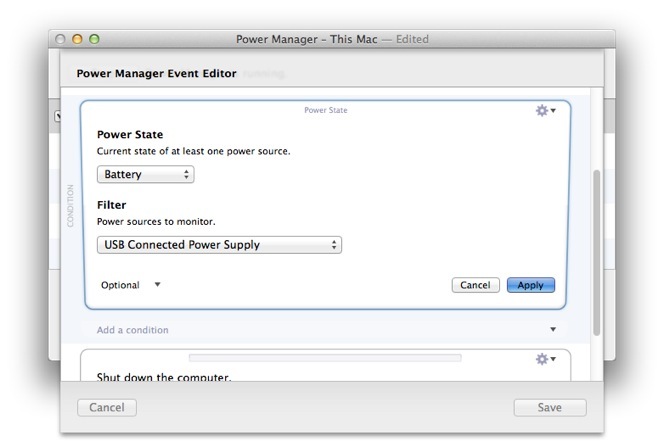 Once triggered, the event uses the power state condition to test if the Mac is being powered by a battery. 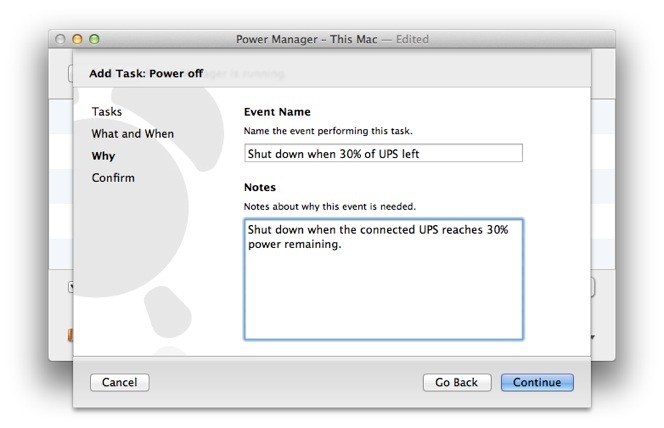 If the Mac is being powered by a UPS based power supply, the event continues and begins shutting down. 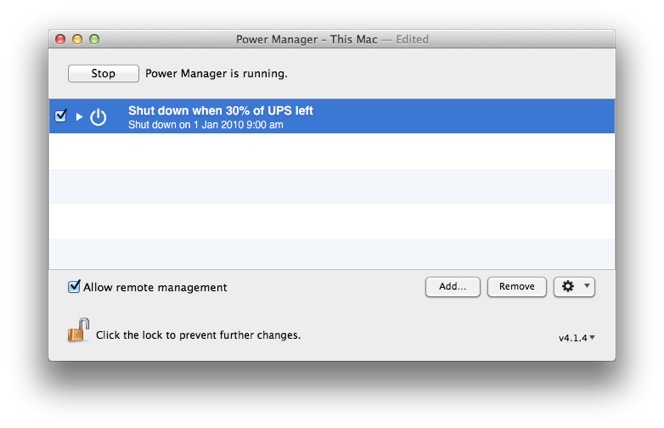 Given the need for the shut down to complete, Power Manager will ensure your Mac does shut down – even if other applications attempt to block it. 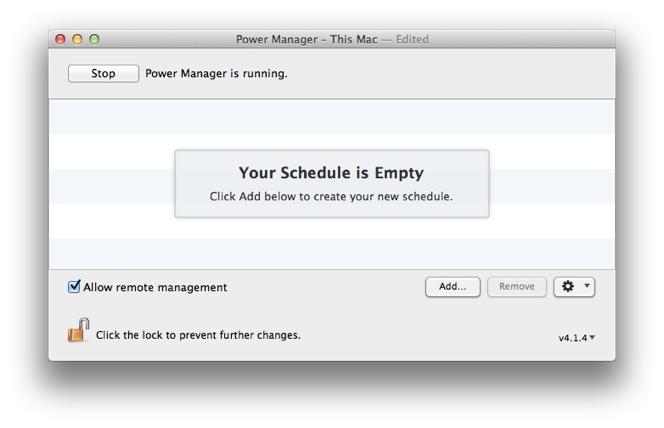 Power Manager works hard to ensure your schedule is adhered to. 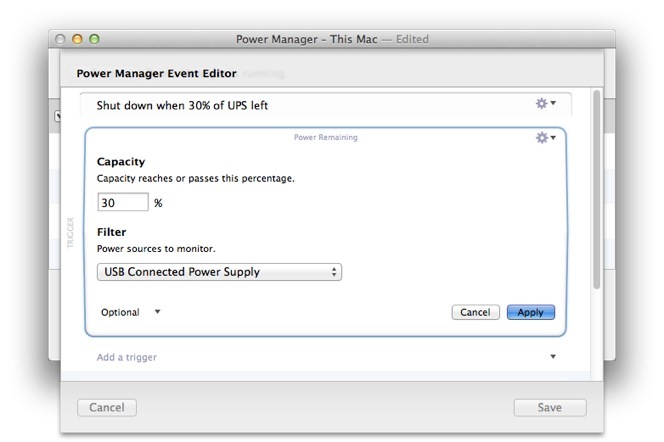 With this event as a basis, you can now create uninterruptible power supply triggered events to ensure your Mac remains safe. This article was posted in PM4, Power Manager, and Recipe and tagged battery, and Uninterruptible Power Supply.